…and if you thought the crowds had been wild before, that was nothing compared to the solid noise erupting from the audience as superstars El Perrito and La Cobra Vuelo enter the ring. It’s impossible to hear even the loudspeakers over the cheering fans of these two fighters. And the fight hasn’t even begun yet. Welcome to the world of lucha libre, Mexican freestyle wrestling, a sport in many ways similar to US style wrestling but where personalities are even more colorful, losing your mask is the ultimate humiliation and emotions run even higher, as they do with many things in Mexico. 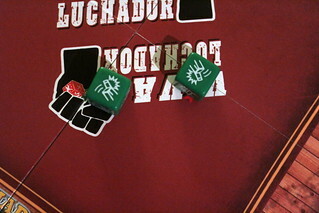 As they will around your game table when playing Luchador. Luchador is essentially a very simple game: first all players make their pick from the six available luchadores – who have different looks and flavour texts, but no individual strengths or abilities. You can play in two players, one vs. one, but you can – and really, really should in my not at all humble opinion – play two vs. two or three vs. three in tag teams. You’ll still only have two fighters in the ring at a time, but you’ll have more people standing around cheering, groaning, and trash-talking the other team. And that’s what lucha libre is about, isn’t it? The two active fighters each roll their teams four Wrestling Dice. Dice landing outside the ring are discarded, so are dice showing a Miss. Any Hit rolled will let you roll the green Hit Die in a second, unless your opponent rolls a Block or, even worse for you, turns the attack back on you with a Counter. Each unblocked Hit or countered opposing Hit then lets you roll a Hit Die. They show what kind of attack you perform, from a simple karate chop all the way up the violence scale to hitting your opponent with chairs and tables.The only difference between the different attacks is the damage they do to your opponent, from one to three points. Especially the higher results must always be accompanied by loud groaning from the victim’s team and loud cheering from the one doing the hitting. Groaning and cheering are mandatory. Trust me on that. They are essential for your enjoyment of the game. Flying Double Chair Special Attack! Cheering and groaning grows even louder when someone uses two Hit results to roll the big, black Luchador! Die. 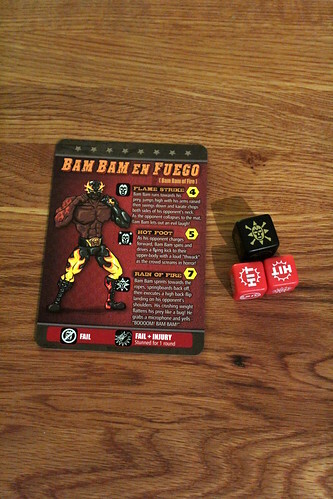 The damage with it goes up to seven – that is a lot in a game where your maximum Strength is 21 – but more importantly the special luchador moves come with different descriptions for each luchador that should be read out in your best lucha libre presenter voice – accompanied by cheering and groaning, of course. But that much damage comes with a risk: if you’re just a bit unlucky, you may still fail your attack, but if you’re very unlucky your attack may fail spectacularly and stun yourself, losing a Wrestling Die for the next round. But sometimes it’s worth the risk, just to see the look on your opponents face, hear the wails of his team and, not to forget, to bring him that much closer to being knocked out and removed from the fight. But if you’re playing tag teams – and I did tell you that you should, didn’t I? – you shouldn’t let it get that far. After a round you may tag one of your teammates with a high-five, accompanied by cheers and groans, and call him into the ring to take over. The fight goes on until either one player is defeated or by prior agreement until one team is completely defeated. Now, even if you haven’t been paying attention, it’s obvious that Luchador is primarily a game of luck. There is a lot of rolling dice and not so many decisions to make: should roll the Luchador Die instead of two Hit Die, should you get your team mate in and should you save a Block result for next round, an option for defensive play. But that’s okay, Luchador is not a game of tactics or strategy, it’s a game about getting in the lucha libre mood. That’s why the cheering, groaning, yelling and high-fiving are essential: if you skip them, you won’t enjoy the game. 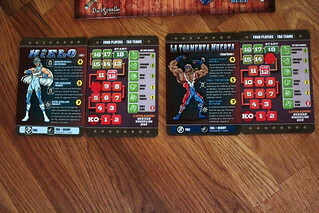 Luchador is a very light game, no question about that. It also could do with some variety. Different abilities for the luchadores, for example. As it stands, Luchador would never work if it wsn’t for its theme. But with the theme it has, it’s a great game to end the night. Light, quick, and boisterous enough to wake you up for the drive home. You really need a crowd that gets into it, though. Luchador is a mood game, and if people don’t get in the mood, it’s not going to work. With the right people, however, it’s great fun. Loud fun, too – you better warn the neighbours. It may not have a lof of substance, but ai caramba it does have style.